The way that soldiers on the Western Front looked changed dramatically during the war. 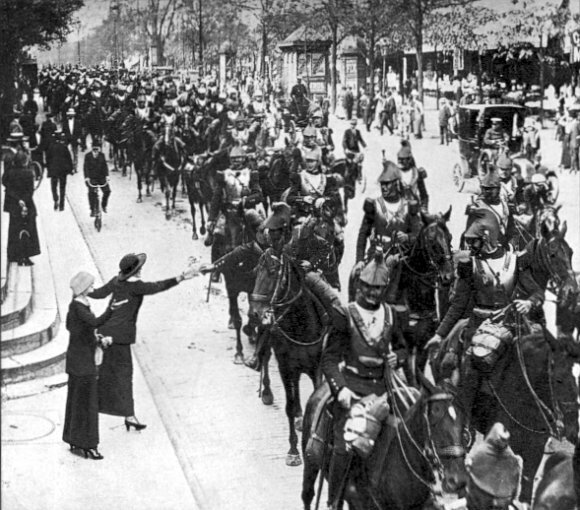 The Germans ditched their pickelhaube, the French cavalry decided that cuirasses were no longer appropriate. The British Tommy, too, changed in appearance – and the Spring and Summer of 1916 marked a significant part of that change as they moved from wearing caps to wearing steel helmets. In his diary, Frank Hawkings of Queen Victoria’s Rifles (otherwise the 9th Battalion London Regiment), records April as a month of training for the newly formed 56th (1st London) Division at Houvin-Houvigneul in France. Met my friend Murray from the 7th Middlesex [another unit in the 56th Division] and we had a jolly evening together at the Hotel d’Amiens at Frevent. Shrapnel helmets or ‘tin hats’ (as they were immediately christened) have been issued. They are made of steel and weigh five pounds. These helmets were the new ‘Brodie‘ steel helmets that became the iconic headwear for British Tommies through the First World War. Until early 1916, British soldiers fought wearing their cloth caps or other warmer headwear. The number of head injuries was alarming – particularly given the large use of shrapnel and the fact that most of the men’s bodies were protected by trenches, while their heads would have been particularly susceptible to injury. All nations involved in the war on the Western Front searched for protection. The French got there first with the Casque Adrian, the Germans ended up with the Stahlhelm (the pickelhaube, the spiked helmet of 1914 was more a decorative than a protective helmet). John Leopold Brodie invented the Britsh steel helmet, a cheaper design that is basically just an inverted steel bowl with lining and a chin-strap. Brodie, born Leopold Janno Braude in Riga in 1873, was an inventor who spent the years prior to 1914 in the UK and the USA, accumulating a number of bankruptcies along the way. Resident in Cheshire in 1914, he and his wife moved to London at the start of the Great War. He patented his steel helmet in August 1915 and the British Army started to issue it towards the end of 1915. By March 1916, some 140,000 helmets…had been issued to troops serving on the Western Front, but being as they were regarded as “trench stores” [i.e. equipment issued when troops went into the trenches] issue was very limited and there were not enough to enable soldiers to claim their own personal issue. Presumably Queen Victoria’s Rifles were among the first troops to be issued them as personal equipment, since they were not about to go into the front line in April 1916. (Two weeks later, Hawkings notes that the division was in no state to go into the firing line as it had no medical or army service corps units attached for some reason). The helmets were widespread by the summer, when the British Army launched its largest ever offensive in the Somme region. They were also sold to, and later produced in, the USA when the Americans entered the war. By the end of the conflict, the shallow inverted ‘soup bowl’, ‘tin hat’, or ‘battle bowler’ had become an iconic object, later adorning both British commemorative statuary, and American war cemeteries. Though there were further modifications, the basic design remained current until 1942 in the USA, and 1943 in the UK. Brodie himself moved to Buffalo, New York, in 1921, became a US citizen and died there in 1945. He outlived production of his famous helmet by just a few days. This is not a sponsored post. The author has allowed reproduction of this post which was first published on Great War London. All links here conform with guidelines set out in Write a Post.